A Miami federal judge has reduced Cuban Five prisoner Antonio Guerrero’s jail sentence from life to just under 22 years. Guerrero, 50, is one of the Cuban Five who were convicted of spying in 2001 because they were tracking anti-Castro Cuban exiles. Judge Joan A. Lenard, in an Oct. 13 ruling, replaced Guerrero’s life sentence with a sentence of 262 months, which means he will be released in about seven years, counting time served since his 1998 arrest and time off for good behavior. Prosecutors and Guerrero’s lawyers had originally asked for the sentence to be reduced to 240 months, 20 years. An appeals court last year threw out sentences originally imposed by Judge Lenard for three of the Cuban Five, including Guerrero, finding the punishment too harsh because the government had never proved that the men had traded top-secret intelligence. Guerrero, born in the U.S. to Cuban parents, is an airport construction engineer by training. He was convicted of spying for Cuba while working at the Naval Air Station in Key West. Guerrero’s attorney, Leonard Weinglass, said he was surprised the judge opted for a new sentence that is longer than the sentence defense attorneys and prosecutors had agreed on. “When you approach the United States government in good faith and all seriousness, you would expect a federal judge would honor that,” Weinglass told reporters after the hearing. The sentence the defense and prosecutors had proposed was put forward as a “reasonable compromise,” Weinglass said. “A 20-year sentence is not a walk in the park … We’re talking about cutting the heart out of a man’s life.” Weinglass said he still plans to appeal Guerrero’s conviction next year on constitutional grounds. The Cuban Five, Guerrero, Gerardo Hernandez, Rene Gonzalez, Ramon Labanino and Fernando Gonzalez, were arrested in 1998 and convicted three years later of acting as unregistered foreign agents and of conspiracy to commit crimes against the U.S.
Three of them were sentenced to life in prison and the other two were given sentences of between 15 and 19 years. 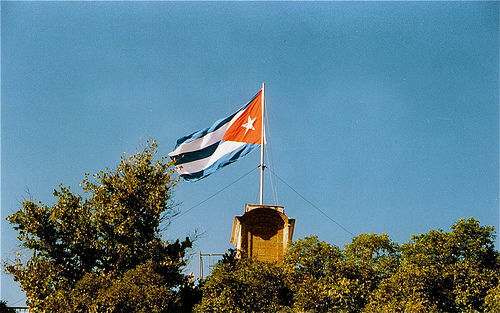 In Cuba the five are regarded as national heroes and anti-terrorists who monitored Cuban-American exile organizations that engaged in terrorist actions to try to overthrow the country’s socialist government. Cuba says the Cuban Five were trying to prevent further terrorist attacks on Cuban soil by right-wing exile extremists living and plotting in Miami. Such groups have a long history of violence against the island since the country’s 1959 revolution. Cuba regards the Cuban Five as political prisoners and has been demanding their speedy release. While Guerrero’s new sentence is not as extreme as the prior one, it is still unfair, Cuban officials said. The reduced sentence was a result of international solidarity and the strenuous efforts of Guerrero’s defense team, the Cubans said. An international campaign for the release of the five men has gained worldwide support. In May 2005, the Working Group on Arbitrary Detentions of the United Nations Commission on Human Rights ruled that the Cuban Five’s trial fell below international standards for due process and the U.S. should either retry or release them. The Miami judge has also accepted requests from attorneys for Labanino and Fernando Gonzalez’ (19 years) attorneys to delay their re-sentencing to allow time to review the evidence the U.S. government used in winning their original convictions. Labanino was originally given a life sentence. Fernando Gonzalez was sentenced to 19 years in jail and has already served more than 11 years of that term. Supporters are hopeful that the sentence-reduction for Guerrero indicates Gonzalez might see a shorter sentence as well, and perhaps gain his freedom soon. The sentences of Rene Gonzalez (15 years) and Gerardo Hernandez (double life imprisonment) are not up for review. The U.S. and Cuba still do not have full diplomatic ties. The U.S. continues the economic embargo on Cuba that has been in place for decades. Many on both sides say the blockade is inhuman, causing great suffering in Cuba, and continues to strain relations between the two countries. Since taking office President Obama has said he wants to try to improve U.S.-Cuban ties after a half-century of hostility. In April, Obama authorized travel and money transfers to the island by U.S. nationals of Cuban descent. A month later he proposed restarting U.S.-Cuba talks on migration issues that had been suspended since 2003. Obama’s new approach toward Cuba has begun to reverse the harsh policies imposed by the administration of George W. Bush. Cuban officials are calling on Obama to release Guerrero and his four compatriots.